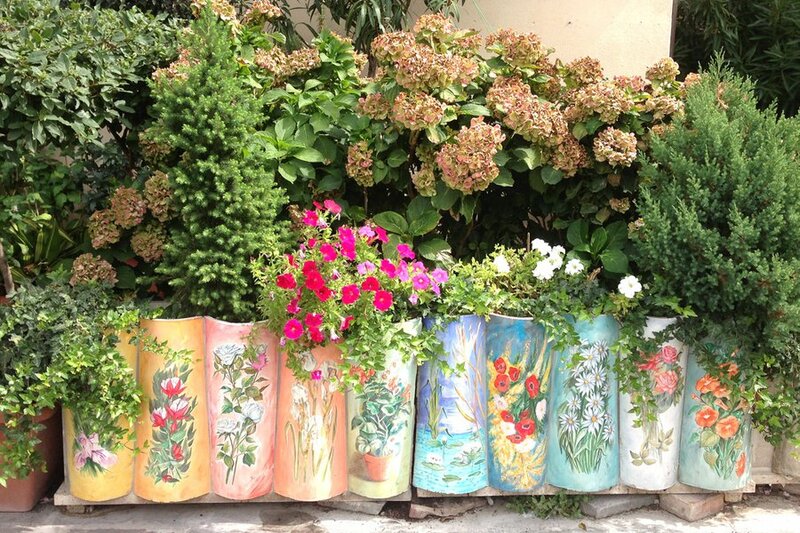 Gentedimontagna co-founders Pavia Rosati and Jeralyn Gerba are living in central Italy for a spell. They went to Montefalco for some wine. The other day, we drove a half hour north to , another charming hill town just off the road from Trevi, yet another charming hill town. (You get the picture, and I'll give it a rest now.) Here what we saw. We drive through the old city walls and leave the car near a playground. Montefalco has a gorgeous, old, fresco-filled church-turned-museum called San Francesco, but the town has become a destination of late for its Sagrantino, the red wine made from the area's indigenous grape. Sagrantino had traditionally been used only for sweet wines, but in the past decades it's evolved, a wine charge led by Marco Caprai of the winery. He worked with the researchers from the University of Milan to study the grape's potential, a gamble that's yielded great results. The Sagrantino we go crazy for today is rich, deep, and tannic. I could tell you that you'll detect hints of tobacco on your palate, but then you'd tell me that I was full of it, and you'd be right. Let's leave it at this: Sagrantino is big, terrific wine. 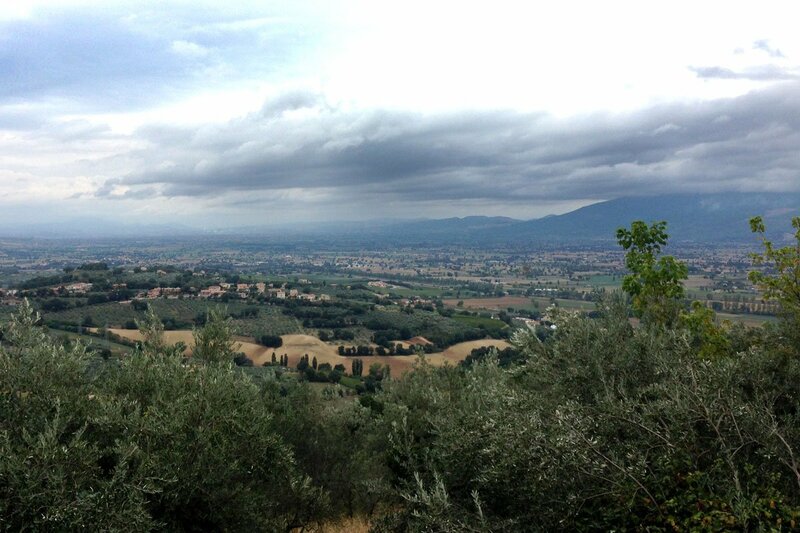 And Montefalco is a great place to spend a few hours. We walk around Piazza del Comune, which isn't a typical square but rather a circular area at the highest point of the hill. 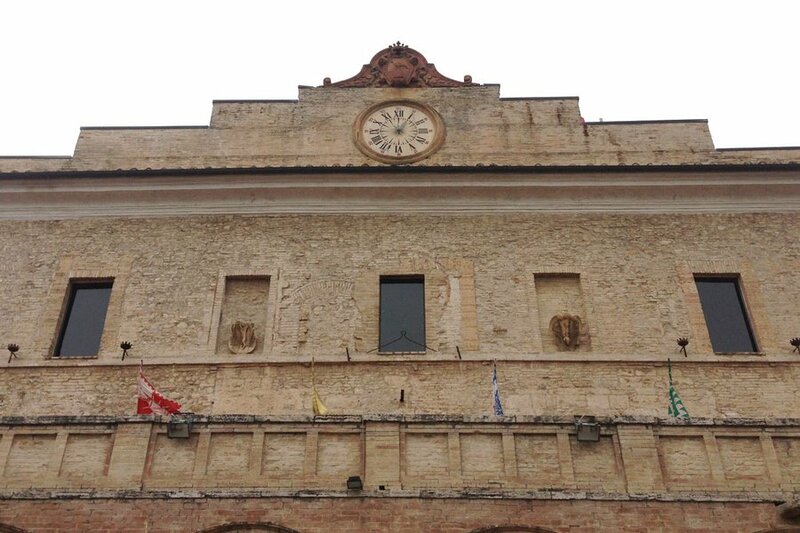 Town hall (the comune) is on one side and Santa Maria di Piazza, a small chapel filled with reproductions of the city's best religious artwork, is on the other side. 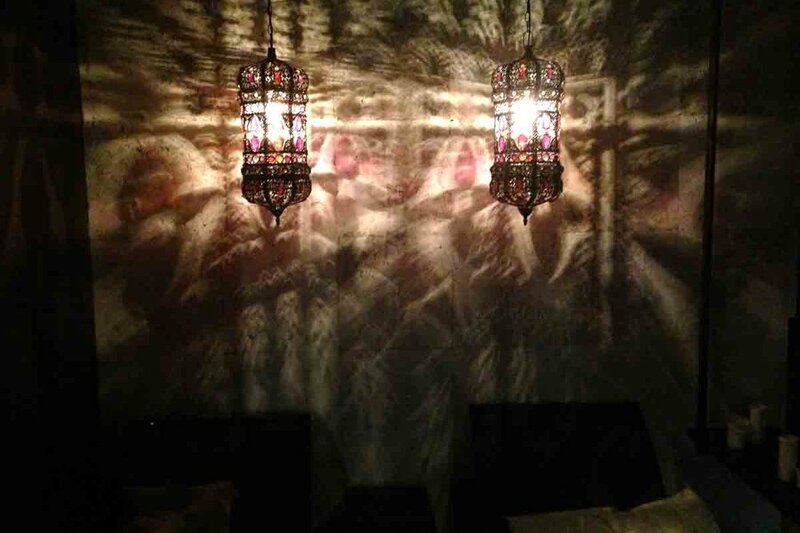 Next door to town hall is , a really stylish and mod 10-room boutique hotel. The lobby is filled with modern art: an exhibit of somewhat frightening versions of classical Flemish-y portraits and a piece of complicated multi-part sculpture by . There's a small spa in the basement whose primary feature is a plunge pool built in what had once been the building's cistern. Excellent. (Collecting rainwater in the 1500s; soothing spoiled travelers 500 years later: Everything evolves.) I would come back and stay here for sure. But everyone is getting restless for lunch, so off we go. 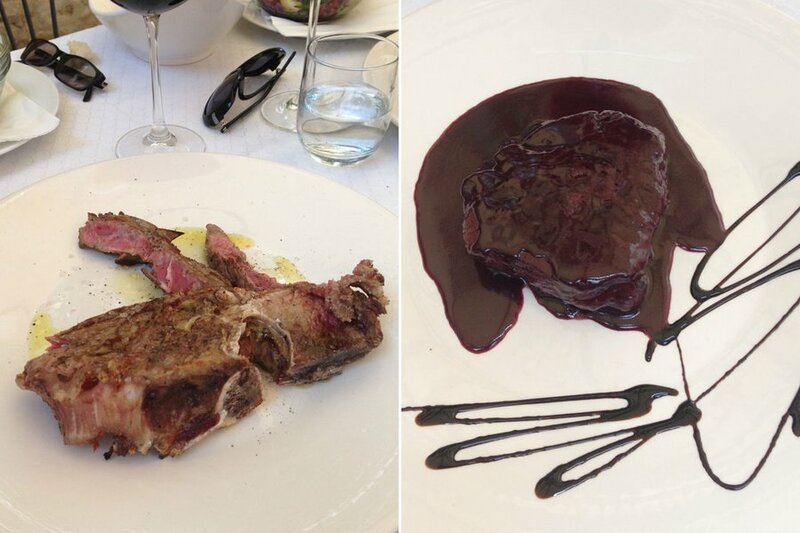 The speciality around here is filetto al sagrantino, filet in Sagrantino sauce, and I'm told that the restaurants around town have a competition to see whose is the best. , our destination, historically takes the prize. The restaurant isn't messing around when it comes to meat: The first thing I see when I go inside is the wood-burning grill and a cutting board covered with blood. Some people might be disturbed by this, but I'm not one of them. 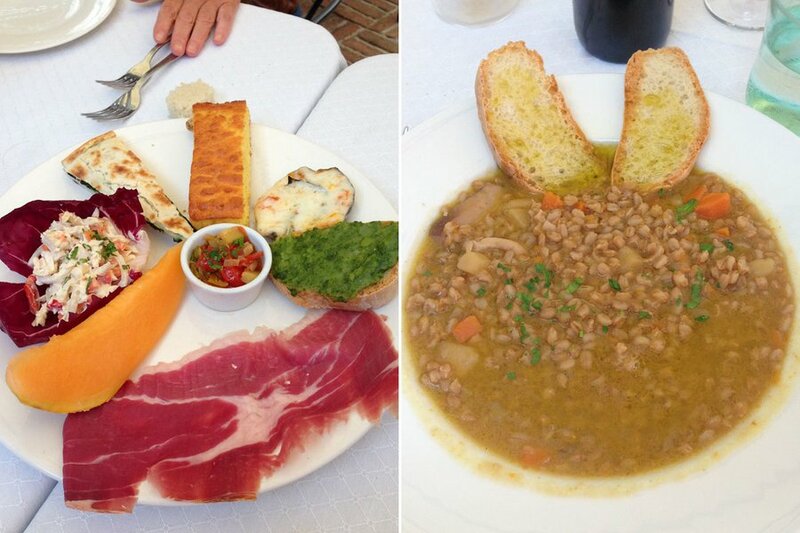 We start with assorted appetizers: hand-cut prosciutto, cheesy bread, herby bruschetta, eggplant parm, followed by bowls of cappelletti in brodo and a dish of farro with chick peas that could easily have fed 20 people. My friends split a Chianina steak among the three of them. 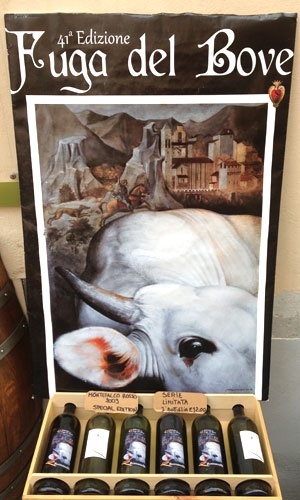 (Chianina being the preferred cattle of the central Italy.) It was served extra bloody, as it always is, no matter how you ask for it to be cooked. The wine sauce on my filetto is so thick and so artfully displayed that it looks like flourless chocolate cake. It's a brief moment of cognitive dissonance quickly forgotten with the first bite. We drink a 2010 rosso, and then we drink another one. We all share a slice of cresconda for dessert, but most Italian desserts (except for fresh figs), it's not worth the calories. I'm a pretty lapsed Catholic, but so is Italy in general. Religion, as I've always encountered it here, is everywhere, but it's less about practicing and it's more about the culture of the striking churches filled with stunning artwork. 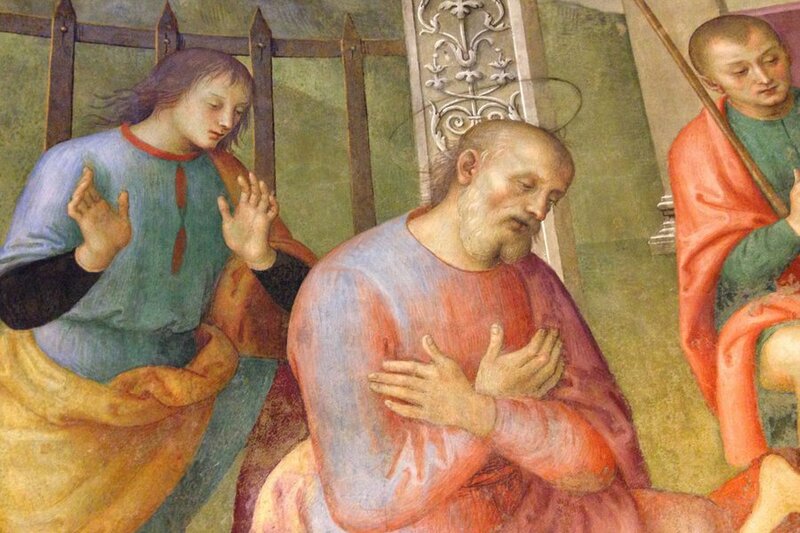 Museo Civico di San Francesco has a cycle of frescoes about the life of St. Francis, who lived around these parts, painted by . (The man has four Zs in his name. How can he be anything but awesome?) 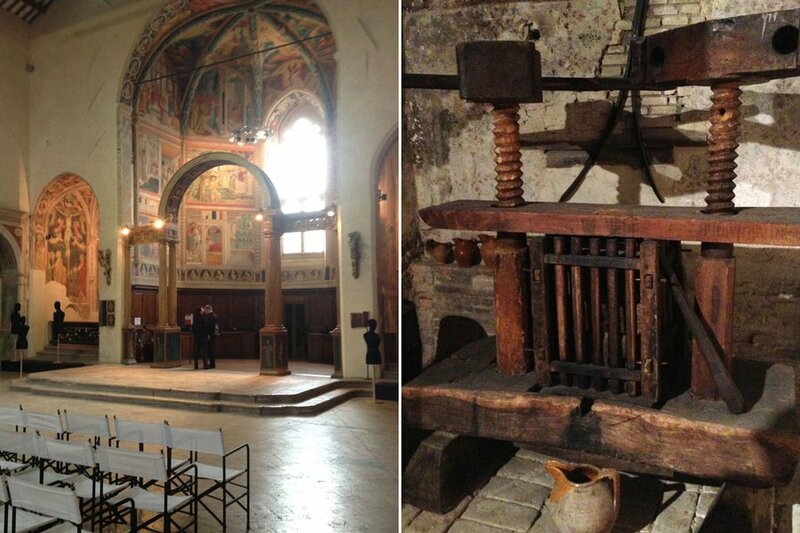 The galleries upstairs are filled with religious paintings; the basement is filled with the various implements that the monks used to use to make wine. I'm the last of our group to leave because I was busy taking a billion photos. I have a thing for tablecloths and napkins and the kinds of kitchen textiles that take eight hours to iron. My husband had to tear me away from the shop across the street form the church. (Textiles: Another local speciality. Seriously, it's no accident my people are from here.) I wanted to buy everything, including the red leather satchel with white topstitching that I totally didn't need. Most wineries are pretty boring to visit, unless you're having a multi-course dinner in a picturesque, candlelit cantina or are getting a serious tour of the winemaking process. If you're just a shmuck who drives up for a look around and a few swigs of free wine in a plastic cup, well, I always think it's a waste. But we are the shmucks who drive up to the and pop in to see what's on offer. We taste a white, almost as a joke, since this is the strictly red territory, but they were talking up their Cuvée Secrète, and who doesn't want to taste a secret Italian wine with a French name? The nice lady doing the pouring swears that she had no idea which grapes go into the blend. I'm pretty tipsy, but I hold back from pointing out that the map on the wall clearly indicates every varietal they grew in their vineyards. I wasn't taking it seriously, but this is a serious vineyard, and I've been drinking their wines all month. Wine Enthusiast even named them 2012 European Winery of the Year. Caprai, incidentally, is the fancy textile company that last year launched that insane Italian craze for , the multi-colored silk macramé bracelets that everyone is wearing. 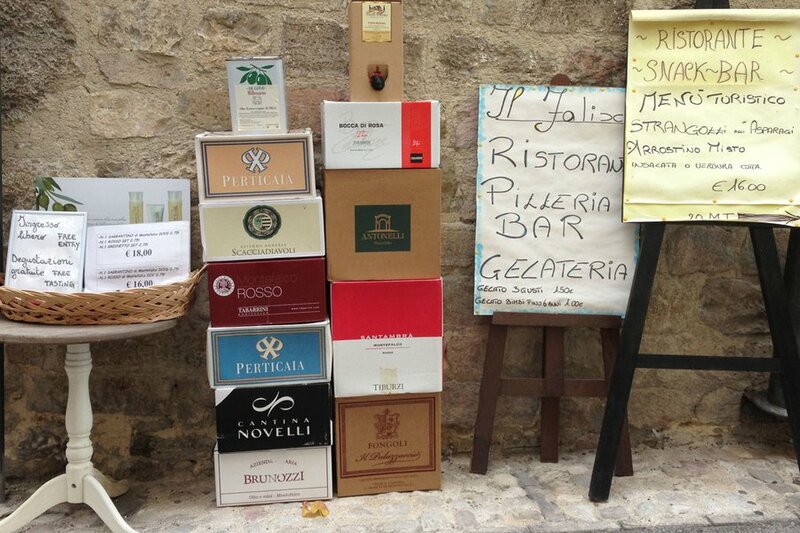 They sell them in the shop; there's a Sagrantino style. And that's it! But it was totally enough. 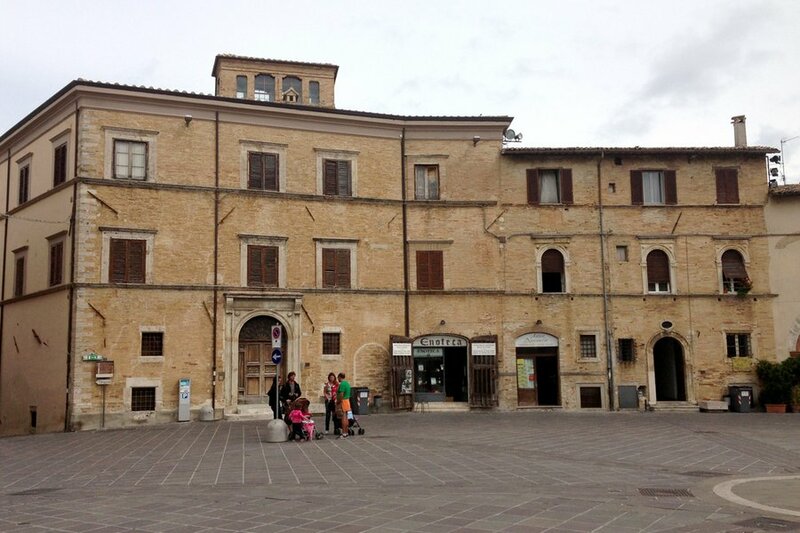 In the main piazza in Montefalco. The church of San Francesco. Upstairs, the sacred. Downstairs, the winey. 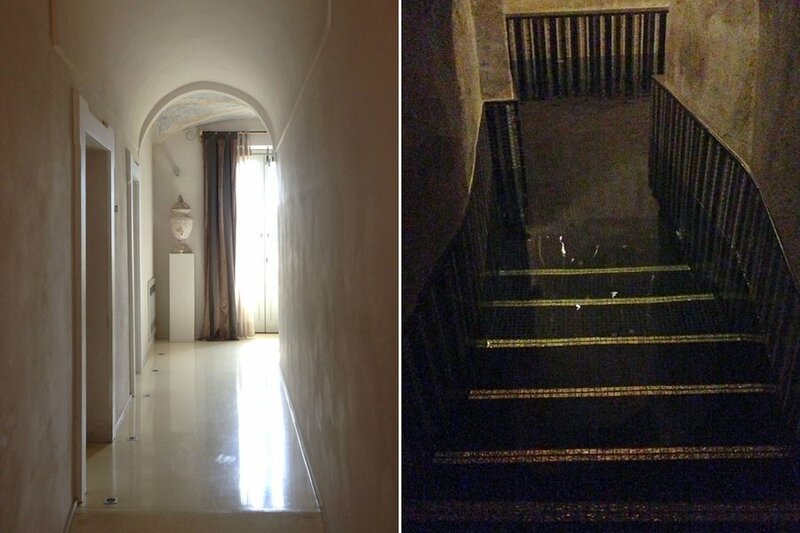 A look around Palazzo Bontadosi: the lobby and the spa. A detail at Palazzo Bontadosi Spa. 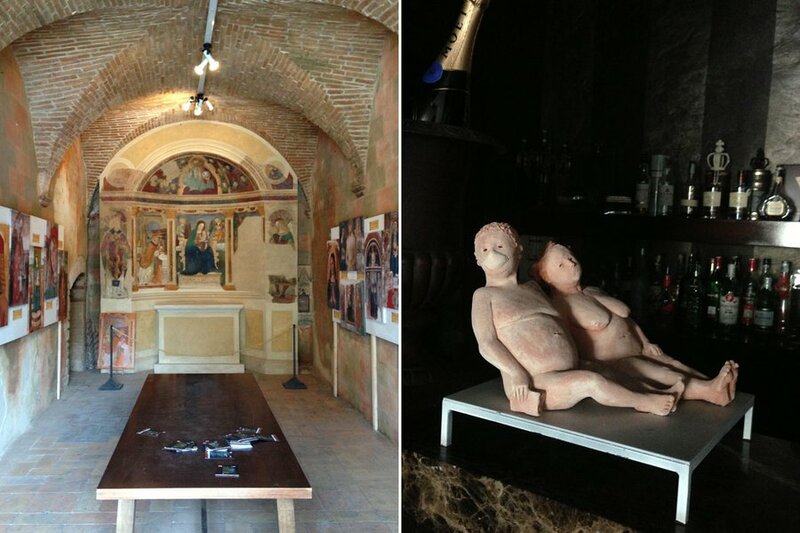 Art in the Piazza: Santa Maria di Piazza on the left; the lobby bar at the Palazzo Bontadosi at right. Lunch at Coccorone begins with the first courses. 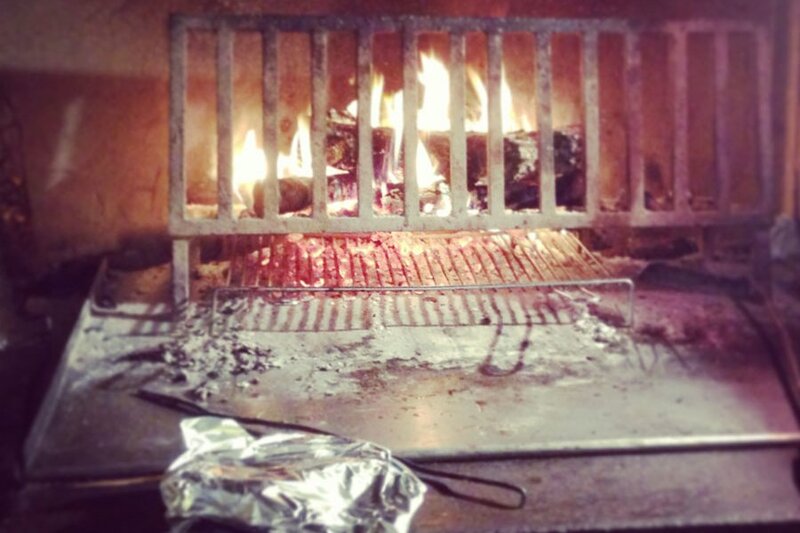 Then continues with filetto al sagrantino and chianina on the grill. The hearth where they cook at Coccorone. 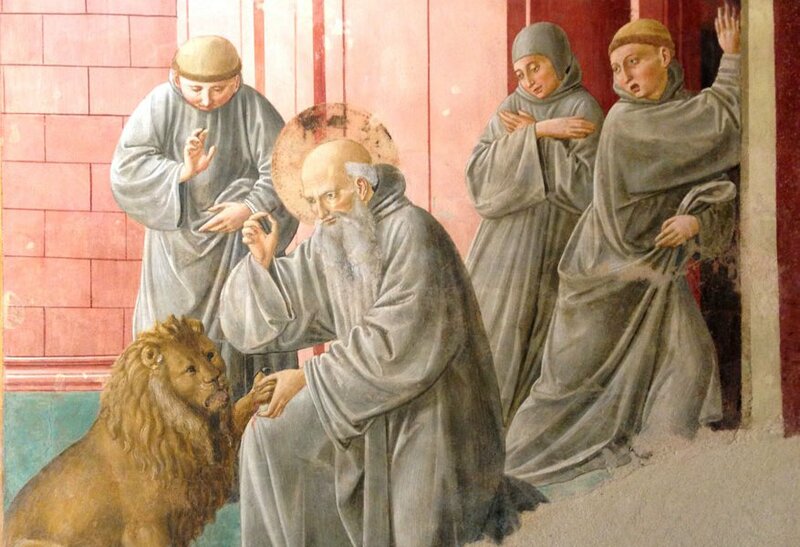 The life of St. Francis, as seen at his namesake church, San Francesco. 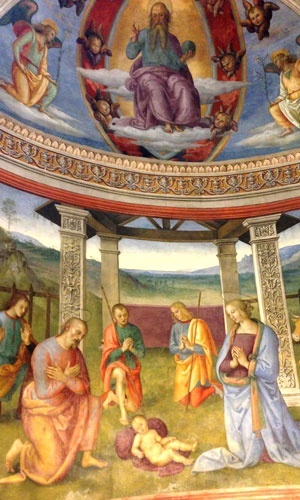 One of many fresco details at San Francesco. 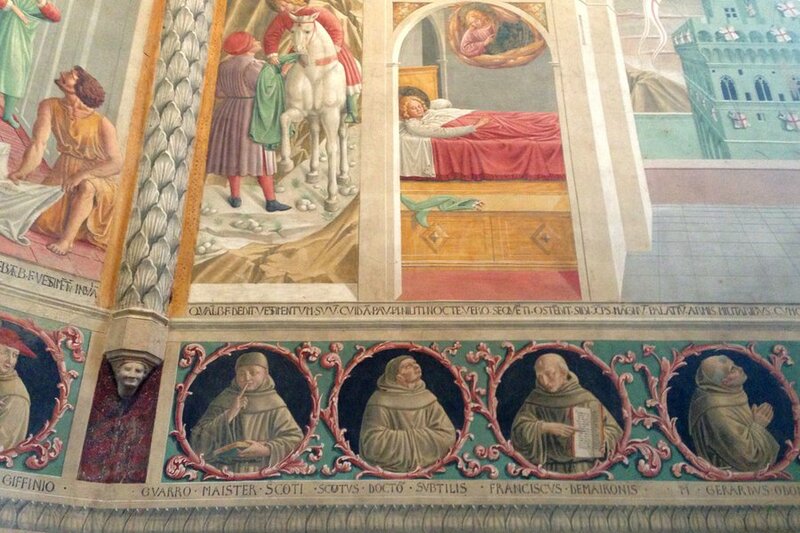 The four evanglists at San Francesco. 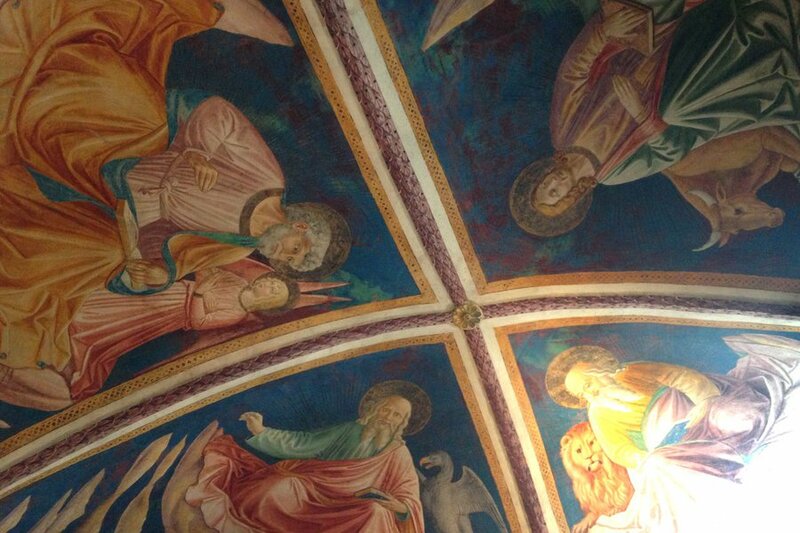 Details from the nave of San Francesco.